EVAN OGAN. Among the many prominent merchants of the busy town of Sorento, the gentleman whose name appears above is numbered among the most energetic and ambitious, he is a hardware merchant and carries a large and complete stock of goods. Mr. Ogan was born near Cumberland, in Guernsey County, Ohio, August 1, 1849, and was the eldest of the family of ten children born to Lee and Tameron (Bay) Ogan. Lee Ogan was born near Cumberland and was the eldest in a family of seven children. His father, Lee Ogan, Sr., together with two brothers, came from Scotland. The brothers settled in Tennessee and Lee in Ohio, where he died in 1872, at an advanced age. The father of our subject was a farmer by occupation, while one of his brothers, Peter, is a prominent Baptist preacher. Of the ten children of whom our subject was the eldest, there are now living seven, as follows: Margret, Angeline, William Jasper, Nancy J., Melinda and Lucinda, beside our subject. The eldest sister is now the wife of John West and resides on a farm near the old homestead in Ohio. Angeline is the wife of Henry Walker, of St. Louis, while William is a farmer in Missouri, near Springfield. Nancy is now Mrs. John Wise, and her husband is a farmer near Springfield, Mo. Melinda is the wife of a Mr. Spratt, and Lucinda is living in single blessedness in Kansas. Evan Ogan grew up as most farmer boys do, his duties at home interspersed with school and merry-making. He received a fair education and, equipped for the serious business of life, when twenty years of age, or in 1869, he started out to make fame and fortune in the West. He spent about a year in Louisiana, Mo., and finally settled in St. Louis, where he was engaged in the pump and machinery business. He remained there until 1875 and then located at Greenville, Bond County, where he was engaged in selling farm implements. He was thus occupied until 1883, when he came to Sorento and entered the employ of Cress Bros., for whom he worked one year and then launched into the general hardware business on his own account, and since that time has built up a large and constantly increasing business. In 1891, Mr. Ogan built the large two-story block where he is now located. It is quite imposing in size and style of architecture and is altogether a handsome piece of property. Our subject has been a Republican during all his voting years. He was a member of the Town Board of Sorento when the town was incorporated and is at present serving as Tax Collector. In his social connections, the original of this sketch is u Knight of Pythias and is, moreover, a member of the United Woodmen and also of the Ancient Free and Accepted Masons, holding membership with Madison Lodge No. 560, New Douglas. In 1871, our subject's parents removed to Southwestern Missouri and there the mother died about 1884. The father is still living at the old home in Ohio and has reached a patriarchal age. In 1875, Mr. Ogan was united in marriage with Miss Sophia C., a daughter of Col. Benjamin Johnson, a prominent citizen of Missouri, who was one of the parties that opened up the iron mines at Pilot Knob, that State. Mrs. Ogan is a lady of marked culture and intelligence. She is a graduate of a St. Louis school and was for some years a teacher. Their two children are named Albert Lee and William Evan. 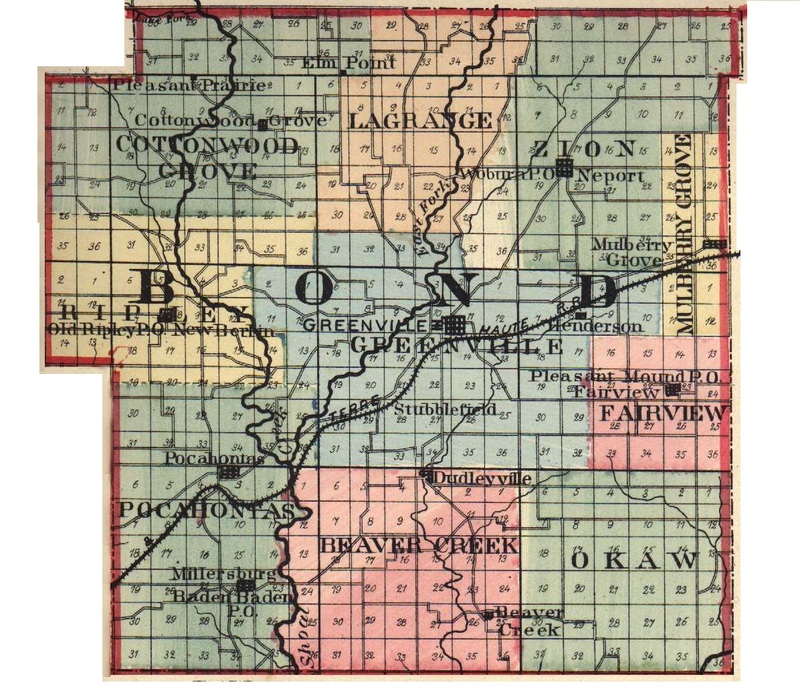 Extracted 04 Dec 2016 by Norma Hass from 1892 Portrait and Biographical Record of Montgomery and Bond Counties, Illinois, pages 266-267.